Corporate Social Responsibility (CSR) defines our approach to business. We leverage a variety of resources in pursuit of economic, environmental and socially sustainable operations. Over the past 40 years, we have continuously made improvements across our operations. We understand that sustainable business practice is an ongoing commitment to the wellbeing of our employees, the environment and the communities where we work. We are committed to entering new markets and creating innovative, cost-effective and quality products for the aid and relief, public health, and development sectors. We focus on financial sustainability, relying upon continuous innovation and product diversification. We focus on creating a safe, diverse, merit-based working environment in Dubai and Pakistan that values teamwork yet allows for individual development. We invest in the communities where we work. 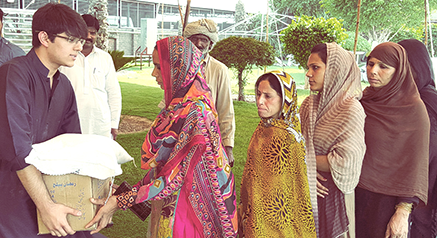 Through our non-profit, the Bilqees Sarwar Foundation (BSF), we continue to expand our pledge to our communities. Our overarching goal is to alleviate suffering during emergency situations and to build community resiliency through improved health care services and educational opportunities. In 2016, we reopened our Bilqees Sarwar Hospital and Razia Begum Dialysis Centre in Pakistan. As a result, we provide more than 12,500 people with free or subsidised care. Minimising our ecological footprint is considered to be an incentive rather than a burdensome exercise in compliance. We are committed to reduce emissions and waste, while seeking to recycle and reuse across our production processes wherever possible. To view our CSR Chronicles, click here. To know more about our CSR initiatives, click here.